Our 8-12 novels have great potential as class, group or personal reads, and are ideal as a quick fiction fix for keen readers as well as achievable for their less confident peers. 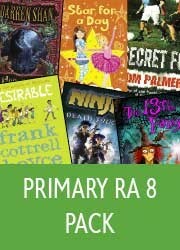 Save 15% when you buy this pack containing the full range our reading age 8 titles for primary. Quality short novels by big-name authors. Perfect class, group or personal reads - quick fiction fixes for confident readers, achievable for strugglers and loads of depth for discussion and analysis.